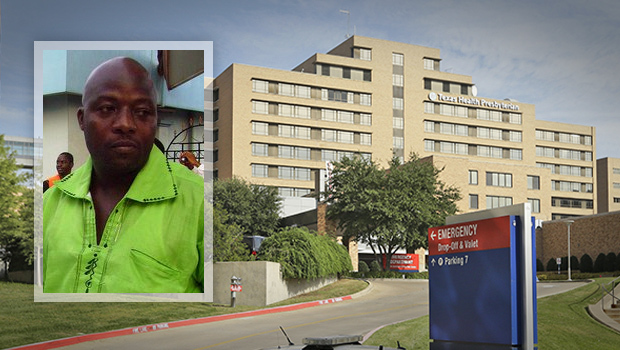 DALLAS -- The lone U.S. Ebola patient is in critical condition, the Dallas hospital that has been treating him reported Saturday. Texas Health Presbyterian Hospital Dallas, where Thomas Eric Duncan, didn't provide any further details about his condition and a hospital spokeswoman, Candace White, didn't immediately respond to emails and phone calls. The hospital previously said Duncan was being kept in isolation and that his condition was serious but stable. Duncan traveled from disease-ravaged Liberia to Dallas last month before he began showing symptoms of the disease. Health officials said Saturday that they are monitoring about 50 people for signs of the deadly disease who may have had contact with Duncan, including nine who are believed to be at a higher risk. Thus far none have shown symptoms. Among those being monitored are people who rode in the ambulance that transported Duncan back to the hospital before his diagnosis, said Dr. Tom Frieden, the director of the Centers for Disease Control and Prevention. On Friday, a hazardous-materials crew decontaminated the Dallas apartment where Duncan was staying when he got sick during his visit. The materials were sealed in industrial barrels that were to be stored in trucks until they can be hauled away for permanent disposal. The family who lived there was moved to a private home in a gated community, where they are being carefully monitored. The city had been having trouble finding a place that would take in Louise Troh, originally from Liberia, her 13-year-old son and two nephews. The materials in Duncan's apartment had been there for three days after Duncan's diagnosis. There are questions as to why a hazmat unit was not ordered there sooner, reports CBS News correspondent Manuel Bojorquez. How can health officials stop Ebola from spreading? Duncan arrived in Dallas on Sept. 20 and fell ill a few days later. After an initial visit to the emergency room at Texas Health Presbyterian Hospital, he was sent home, even though he told a nurse he had been in disease-ravaged West Africa. He returned to the hospital two days later, last Sunday, and has been kept in isolation ever since. The hospital issued a news release late Friday saying that the doctor who initially treated Duncan did have access to his travel history, after all. It had said Thursday that a flaw in the electronic health records systems led to separate physician and nursing workflows, and that the doctor hadn't had access to Duncan's travel history.